13 days left, Give Your Support for the Utopian Colony Indiegogo Campaign! Utopian is one of the most known initiatives on Steem blockchain, it has contributed massively to the growth of many projects both on Steem blockchain and outside Steem blockchain ever since it came into existence in 2017. 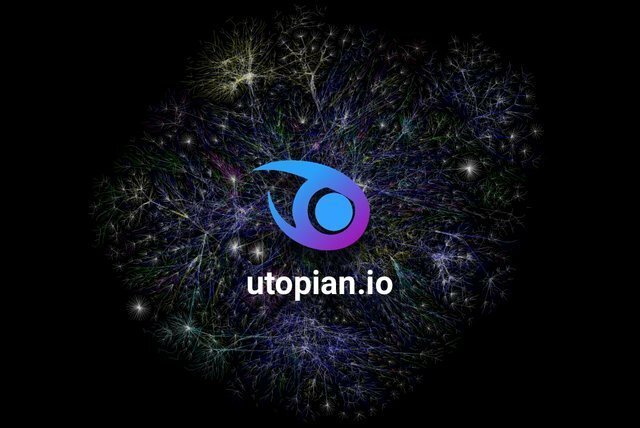 Utopian has over 70,000 contributions, 5,000 contributors and 9000 repositories which is impressive considering the fact that Utopian started just about a year ago. Utopian has majored in empowering Open Source Innovation and contributions. It is a non-profitable initiative aimed at helping new innovations and creative minds blossom into real-world use case to solve problems. Utopian is building a new platform and has named it Utopian Colony, it will connect all contributors (Copywriters/content creators, Marketers, Graphics designers, and Translators) directly to the project owners which could in turn additional earnings through bounties and in a variety of currencies other than Steem. Utopian Colony is a collaboration platform made to boost the development and growth of open source projects. As a project owner, you can build and incentivize contributor communities through tips and bounties. You are not alone in funding your project, as everyone can tip the work done, while your project gains interest from potential investors. As a contributor, you can work anywhere, anytime, while doing something great: fast-forwarding the development of innovative open source solutions. Utopian Colony is the first Crowdsourcing platform was built to connect open source projects with all contributors who have professions in the digital field. This project campaign launched with the aim that the ecosystem contained in the open source project can adopt the latest technology so that all professionals working in the digital field can take part and share the innovations they have. Utopian has set an impressive milestone of releasing the early version of Utopian Colony by Q2-2019. 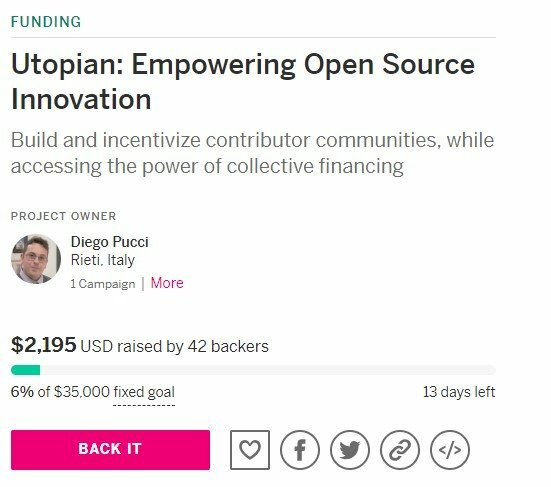 Utopian needs to fund-raise a total of $35,000 to be able to launch this great initiative, currently Utopian has raised just over $2000. It has been an interesting journey for Utopian Colony and now we have a task of fundraising enough funds for this project. Currently, only 6% of the funds are raised so far which is honestly very far from what we need considering that this campaign has been running for some days now and we have only about 13 days left to close the campaign. We shall not give up, it's our duty to donate and let other people know about this campaign as well. This article is to remind you to support Utopian Colony in the Indiegogo Campaign, your efforts are appreciated. To support this Campaign you will either donate for Utopian Colony with some funds or buy some perks that also come with some enticing incentives, you can also share about this Campaign on all other platforms to get as any interested contributors as possible. As you can see, $2,195 has been raised by 42 backers and our fixed goal is exactly $35,000. Not reaching that goal will result in giving refunds or pushing harder for longer to raise more funds. After going to Indiegogo Campaign, proceed to sign up, then log in and click on the love ❤ symbol to follow the project and also click on BACK ITbutton to buy available Perks, more on the perks later. Don't forget to share on your Facebook and Twitter, the Facebook and Twitter icons will take you directly to sharing about this Campaign. 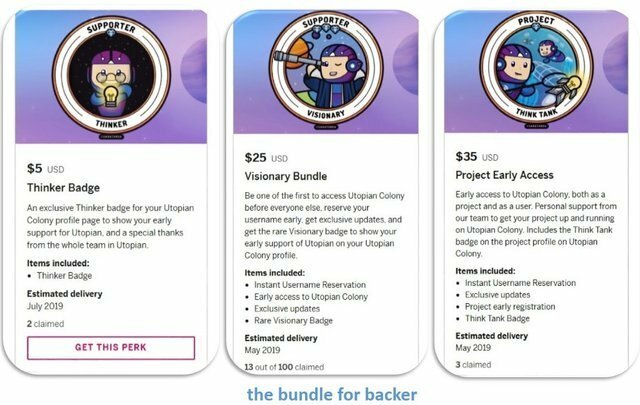 Utopian has decided to give away some incentives in form of secret perks that can be purchased, this will result into more support for this Campaign, attract more interested contributors and reward some outstanding contributors as well. These will be in the form of exclusive supporter badges, early access and unique usernames (for early access) to display on the Utopian Colony profile. These badges will showcase the level of your support and the achievements you have earned through participating on the platform. Some perks that you can purchase. For more details about the perks and their benefits check out this post. Support Utopian on Indiegogo to Strive for more cool innovations and build blockchain.